A Wikipedia Workshop for Konkani writers writing in the Kannada script, was organised by All India Konkani Writers’ Organisation (AIKWO) in association with Wikipedia, on Apr 6, 2014, at Kalaangann, Mangalore. Read the media release published in Daijiworld on April 6 here. Dr U. B. Pavanaja (Programme Officer – Indian Languages, Access to Knowledge Program, The Centre for Internet and Society), conducted the workshop. Harriet Vidyasagar, Wikipedian volunteer, was also present. This one-day hands-on workshop included presentations on Wikipedia in general, and Konkani Wikipedia in particular, and the participants were taught how to add and edit Konkani articles in the Kannada script in Wikipedia. On behalf of Mandd Sobhann, Dr. Pratap Naik SJ handed-over three research works published by Mandd Sobhann – 1. Konkani Songs Among Mangalorean Catholics, 2. 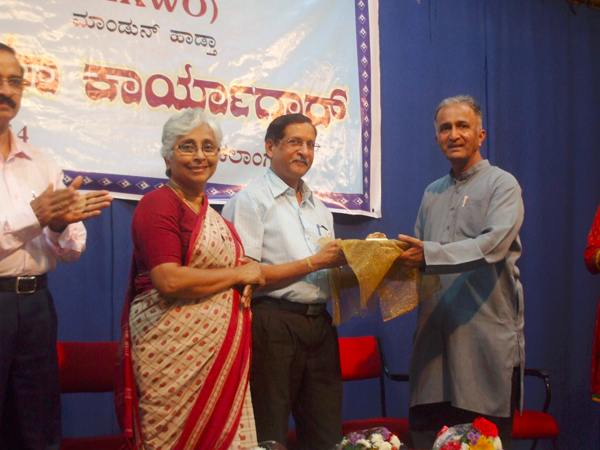 Anthology Of Konkani Literature In The Kannada Script and 3. Mandd Sobhann And Its Impact On Konkani Language And Literature – the representatives of Wikipedia – Dr. U. B. Pavanaja and Ms. Harriet Vidyasagar, to be updated in the Konkani Wikipedia. Shri Eric Ozario, Gurkar – Mandd Sobhann, Ms. Irine Rebello, Secretary – Mandd Sobhann and Dr. Edward Nazareth, General Secretary – AIKWO, were present on stage.